Oh, rice pudding with strawberry jam. Let me count the ways I love. Your milky richness, hearty rice-y-ness and strawberryliciousness are too good to be true. Sponsored post. All thoughts, opinions and experiences are my own. You’re one of the reasons I keep milk in the fridge. Always. Is it one of your fridge staples? My fridge staples are milk, yogurt, butter, eggs and egg substitute. There are probably a few more that sleep over regularly, but these five friends have pretty much moved in permanently. But have you tried NEW DairyPure milk? It’s available nationwide, so look for it in your dairy case. And then there’s the fact it’s the shining star of this rice pudding with strawberry jam recipe. Combine rice and DairyPure milk in a large pot. Bring to a boil over medium heat, then quickly lower to a gentle simmer. Add vanilla, maple syrup, cinnamon and nutmeg. Stir well. Simmer until liquid is almost completely absorbed, about 30 minutes, stirring frequently to avoid sticking or burning. Refrigerate rice pudding mixture at least 3 hours. 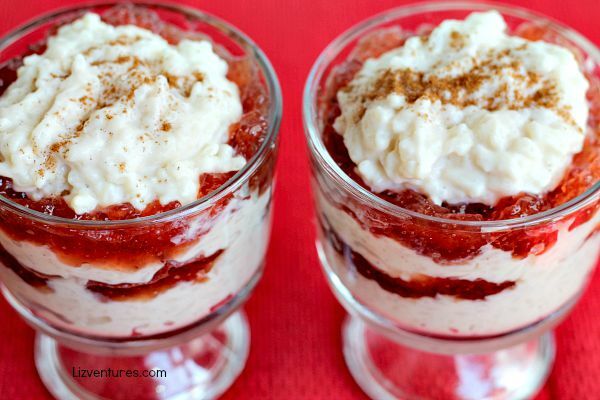 When chilled, spoon layers of 1/4 cup rice pudding and 1 tablespoon strawberry jam into four dessert dishes. Repeat layers. Garnish as desired. *Wakefield Research for DairyPure survey of 1,000 nationally representative U.S. adults ages 18+. Check out new DairyPure milk in your local grocery store, and for the love of Pete, make yourself some rice pudding with strawberry jam too. Are you a rice pudding fan too? This looks so amazing! Double yum:-) Thanks for linking up with us at Merry Monday. This looks delicious! I’m a big fan of rice pudding and tapioca so I’ll bet I’d love this. It seems like a “light” dessert! Thanks for sharing your rice pudding recipe at the Inspire Me Monday link party. 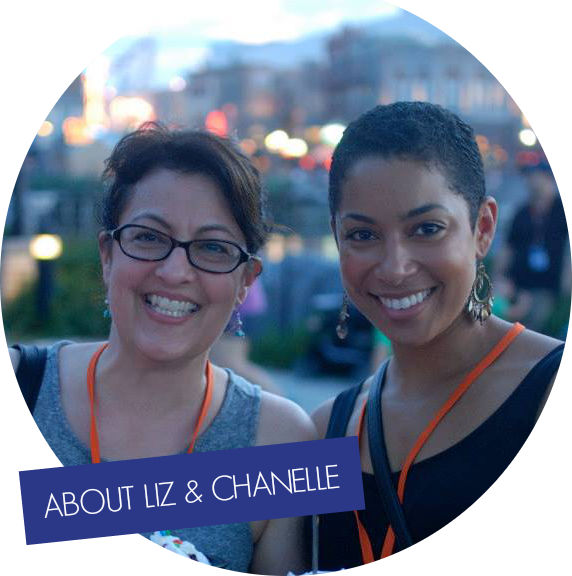 I hope you will join us this Monday, September 21, at 9:00 am EST and share more of your links. I was just in my kitchen 2 seconds ago looking at my trifle bowl wondering, “Why did I buy this? What on earth can I make in this thing.” LOL I guess I read this post at the right time. Delicious looking recipe! I can’t remember the last time I had rice pudding. I know I don’t like tapioca, but I might like this. I have never had rice pudding before but I will have to make this recipe to see how it tastes! I never would have thought to add jam to rice pudding. This looks absolutely delicious. I love rice pudding. I’ve always eaten it plain. I’ve never put fruit in it before. I’ll be trying this recipe. It sounds delicious. My kids can’t get enough rice pudding. I think they would love this idea with the strawberry jam. I also have some blackberry preserves that I think would go nicely with some fresh mint leaves to garnish it. I will only eat my mom’s rice pudding but it’s my favorite!! I never tasted one as good as mom’s but I am willing to try a new recipe and make it my own. I love the idea of making this little parfait with the jam! Rice pudding is one of my favorite sweet treats. It’s something I have been making for years, but I never thought of adding strawberry jam. I don’t know why though, because it looks absolutely amazing! Oh, wow, now that looks delicious! It is perfect for the summer, I would definitely try it! This really looks like a delicious treat, I have not ever had rice pudding I don’t think. I also don’t think my kids have. I must make this for us to try something new! This looks delicious…I don’t think I have ever tasted Rice Pudding…this is a great recipe to check it out. My toddler would probably love this considering how much he likes strawberries. I LOVE rice pudding. I grew up eating kheer (tradition Indian-style rice pudding), and it’s still a very fond childhood pasttime for me. I’m going to have to make some rice pudding soon, I haven’t for at least a year. It has been way too long since I’ve had rice pudding- I always loved it as a kid! I have never made it though, I think I’m going to try this recipe this weekend! I have never had rice pudding. I need to try it. 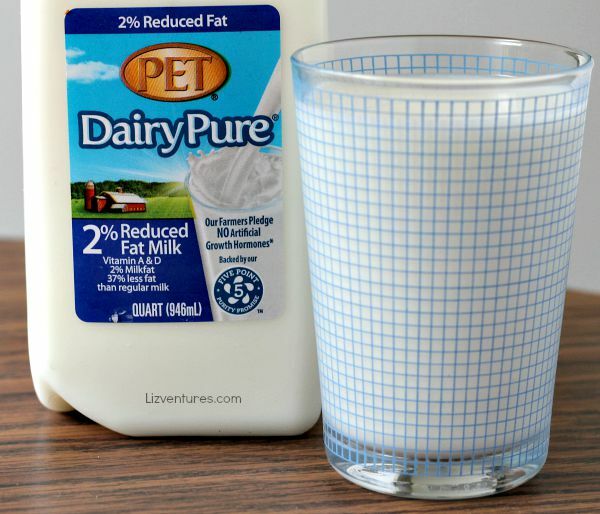 I love Dairy Pure milk! It’s yummy! My goodness this looks absolutely delicious & healthy. Strawberry flavor is my all time favorite & the way the recipe has come out is really awesome. Would love to try this Rice Pudding at home. I am not a rice pudding fan. But I have to admit this sounds like a really great recipe. I will have to give it a try. My daughter and hubby are both milk obsessed…. Like literally…. It’s kinda gross how much milk those two will drink… I will have to look this brand of milk next week when I’m shopping! Oh wow this sounds so yummy and my husband loves rice pudding! I’m going to try this recipe at home! I don’t think I have ever tried rice pudding! It sounds great paired with strawberry jam. OH. MY. GOSH my mouth is watering so hard right now. I love rice pudding, but I’ve never had it with strawberry jam. I usually have it with lots of cinnamon and sometimes raisins, but the strawberry jam sounds divine. I love rice puddings and this looks easy to do. I will save this recipe for later. I normally like “chocoately” type mix ins, but this strawberry jam looks so good. ohhh I seriously never would have thought about adding in the jam with the pudding! My kids would love this. soooo bookmarking this! I have always loved rice pudding, and I usually add raisins and cinammon to it. You’ve reminded me that it’s been ages since I’ve made rice pudding…this looks delicious! I personally don’t like rice pudding, but I am introducing new textures and flavors to my 1 year old so I might have to try this recipe and see if he likes it! I love the smell of homemade rice pudding slowly simmering on the stove. My mom used to make it all the time out of the leftover rice we had from dinner. So many wonderful memories. Never tried rice pudding with strawberries. We make ours a little different due to tradition but I’d love to try this method. I have actually never tried rice pudding before, but that looks and sounds delicious! I will have to try this sometime. I love rice pudding, but I can’t image it with strawberry jam. I will have to try it! It’s so good! If the consistency of the jam throws you off, you could always put fresh sliced strawberries on top of the pudding. Just as good! I bet the kids would love the rice pudding. I love the added strawberry jam idea. This sounds and looks so good. I have not made rice pudding so I will have to try this recipe. The strawberry preservers is a great idea. Thanks for sharing. Oh rice pudding. How I love rice pudding. I need to make this like asap. LOL, its calling my name! I can’t remember the last time I had rice pudding and it didn’t have strawberry jam. That is something I haven’t tried yet. Yum! that looks so amazing! i could use some of that right now. This looks really easy to do, something that I can handle during the busy days. I love rice pudding because it goes well with a lot of ingredients, so versatile! I love rice pudding but I have never made it. This recipe makes it look easy! Love Rice pudding. Great recipe. I love rice puddings, too. The recipe looks easy to do and I can’t wait to try it. I am not into rice pudding its a texture thing lol.. This looks really amazing though, and I am sure my family would love it! I am not sure what I love more, the fact that you made your own rice pudding or that you thought to add strawberry jam into the mix. I started purchasing Dairy Pure about a month ago and find it tastes better than our old organic brand! I need to give it a shot. I’ve never had it, but everyone keeps saying how great it is. You make me hungry, I’m gonna try to make this one. I wish I can make a perfect rice pudding strawberry jam today lol. I’ve always wanted this one!!! Strawberry jam flavor is my favorite, I want to grab it from my screen lol..
That looks pretty and really tasty! I can’t remember when was the last time I had a rice pudding. I have to try this quick and easy recipe! This looks like a fun and tasty dessert or snack. I like rice pudding but I love that you incorporated a strawberry jam in it. What a fun way to try the pudding. I’ve never thought of combining the two, but really, yum! Yes, I’m a pudding fan! I bookmarked your recipe. This will be my first time to make a rice pudding. Oh, this looks yum! I love to eat puddings – one of my comfort foods (I got so many actually). The recipe is easy to follow! Rice Pudding and Strawberry jam, this was made just for me! So good! I remember growing Pet was the only brand of milk for us. I guess some things never change. Yum!!! I love comforting foods like this and I bet with the jam it’s amazing! Definitely pinning so thanks for sharing:-). I’ve never had rice pudding before but after looking at your recipe, I now want some. Looks very yummy! Strawberry jam is my favorite fruit jam! It tastes great in so many treats! Oh yum! This looks heavenly! My family loves rice pudding, and one of their favorites is strawberry jam. This sounds delicious. I haven’t had rice pudding before so I am not sure that I would like it. The rice pudding with strawberry jam looks so tasty. This is a really great dessert meal. I love rice pudding! It is yummy and filling and has the benefit of giving us fiber and complex carbohydrates. Mixing it with fruit makes a great dessert. Thanks for the recipe. I love desserts with strawberries in desserts!! This sounds like a great rice pudding desserts! Confession – I have never tried rice pudding!! This looks so good though, I might need to try it soon. Rice pudding is so delicious and I love to make it. I now have to try it with strawberry jam! Yum! I’m not the biggest fan of rice pudding since it seems a bit bland, but the strawberry jam would totally make it. Can’t wait to try this recipe out with my boys. I have never tried jam and rice pudding together before! It looks yummy! Yum! I love the cool, sweet, grained texture of rice pudding! I will intentionally make too much rice just so I have an excuse to make it! I cannot wait to try this recipe! It sounds delicious! I have never added jam to my rice pudding before. I will have to give this recipe a try. It looks so delicious and easy to make. Strawberry jam can go on anything it wants. I just love it. Can’t wait to try this one. I love rice pudding. The strawberry jam makes it even better! You know, I have never had rice pudding before. I have a recipe that I’ll be trying soon. If we like it, we’ll definitely try your jam version as well! 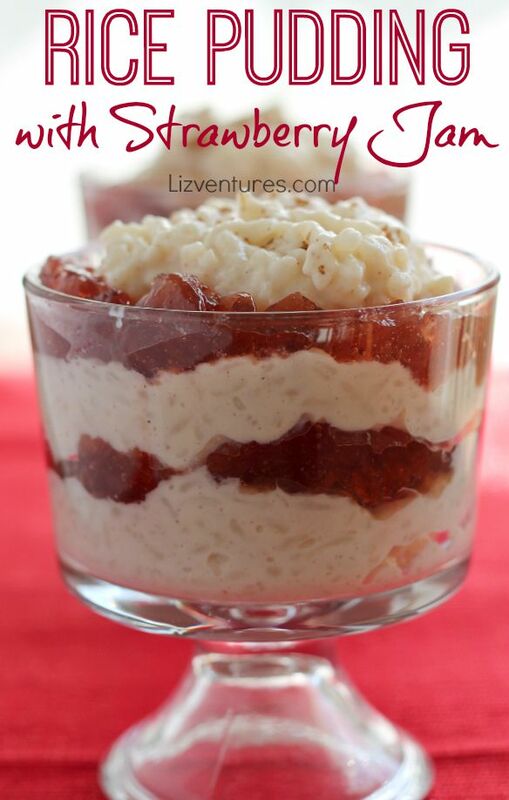 I have never tried rice pudding before but this recipe with strawberry jam looks delicious!! I need to try this asap!! Yum! That looks delicious. My hubby loves rice pudding, so I think he would really enjoy this. This looks so delicious! I love anything with strawberry. Never really had rice pudding, but will give it a try! Wow did I just read that? Never?! Girl you gotta try it! Mmmm, that looks great. Will definitely pass this along to my hubby. He does all our cooking. Can’t wait to try this one. Thank you for sharing. What a great twist on rice pudding! I bet the am makes it nice and sweet! Wow this looks very tasty. I have never tried rice pudding before. YUM! I LOVE rice pudding. This looks amazing, Ill be trying it this weekend. I have NEVER had a rice pudding before, but seeing this has me really curious as to how it tastes. I have Pinned this recipe to try later – I like the ingredients listed here. I know I must have had it once or twice, but it’s not a regular on the dessert menu here. I think I need to fix that! I have never made rice pudding before, but you make it sound so easy. I love strawberry jam on just about anything. I have purchased Dairy Pure milk and although I haven’t tried it because of lactose intolerance, my husband and kids enjoy it. I do love some rice pudding and your recipe sounds delicious! Mmm, that looks yummy. I am always making bread puddings and have never tried doing a rice pudding. I would like to try this. That would make for a fun dish to make to a picnic! Hmmmm…I’m not sure I’m ready to try rice pudding. I’ve heard of it before, but just not sure I’d like the texture. But for those who do, this looks like a yummy recipe. Rice pudding is my favorite type of pudding. I’ve never tried it with anything but raisins. I love making home made rice pudding and your recipe sounds delicious! I personally mostly use nut milks these days but my hubby and girls drink cow’s milk and have been known to run out to the grocery store just for milk. I’m definitely going to have to try out rice pudding – hasn’t been my fav thing but these tips are great! Ohhh my husband loves rice pudding! This is a recipe he would just love, thank you for sharing! I have never had rice pudding before, but it looks really good. I know I love strawberry jam! I am marking this post to give it a try. You know what, I love rice pudding, but I haven’t eaten it in forever because of the carb count! I’ll have to try it with strawberry jelly – YUM! Yum. I’ve never tried rice pudding before but my mom loved it. I wonder if my kiddos would love this. It looks good! Rice pudding is one of my favorite desserts. I have never had it with jam so I have to try this recipe. I used to LOVE rice pudding, but havent had it in a while. This looks really good and I think the kids would like it too. I love this recipe for Rice Pudding!! I think my kids would love this as an after school snack, looks great in those cups. I remember having rice pudding as a kid, but I never leaned how to make it. I should follow your recipe and have my kids try something new. Presentation is everything! I need to get some cute parfait cups like you have. Can I ask, where did you find these? I have looked at BB&B and World Market and could not find this exact style, which is what I want. Milk is huge staple in our house .We go through galllon after gallon with three boys. I’m going to look for this brand. Rice pudding is one of my favorite desserts. I don’t think that I have ever enjoyed it with fruit but this looks delicious. This is nom nom central right now! That looks spectacular! I didn’t grow up eating rice pudding and I don’t think I’ve ever made it. I’m sitting here wondering why not, after seeing your photos and reading the recipe. It looks easy, tasty and oh, so pretty. I never would have thought of this but it sure looks good! I will have to give it a whirl. Great pictures! I have had home made rice pudding and it is interesting. My daughter loved it so that made me happy. This sounds like a great recipe! I love strawberry jam for sure! What a beautiful presentation, too. It looks amazing! I can’t wait to try it! I think my son would love it! Your recipe looks delicious! We have multiple types of milk in our refrigerator. You can never be too sure what someone is going to drink! That looks so good. Rice pudding is one of my favorite desserts but I have never tried it with jam. That recipe sounds amazing. I honestly don’t think I’ve tried rice pudding before. I’ll have to try it very soon because it looks delicious! That way I can try out this recipe if I like it. I do not know if I have ever had rice pudding! This looks so good I may have to try it. I love strawberry jam! This looks yummy. I don’t remember the last time had rice pudding. I can’t wait to make this. When I say the title didn’t thing I would like but see the picture it looks yummy! I love Rice Pudding! My grandma used to make the best rice pudding, unfortunately I don’t have her recipe. I need to try yours! I bet this is delicious! My kids have never had rice pudding, I bet they would enjoy it. I’ve never made rice pudding before but this looks like something I need to try! YuM!! That looks so good. We love anything with strawberry in it. We’re definitely have to check it out. My daughter loves rice pudding! She would be all over this. Well, now I’m starving! Looks like I’m making a trip to the store for some rice pudding! Rice pudding is a weakness of mine! I have never added this fruity twist but I am sure it would be great! I’ve never had rice pudding but this looks so yummy! definitelt a recipe to try! I’ve never actually tried rice pudding. I’ve always thought about it but was afraid my family wouldn’t care for it. I think this recipe might change their minds. The pictures make it looks so good! sadly, I am not a rice pudding fan. My husband loves it though. You would laugh at all the different milks in my fridge. I give my kiddos organic whole milk, my husband uses almond milk and I use rice milk. My family and I love rice pudding, but I’ve never made it with any fruit other than raisins! I think using jam is genius! I can’t wait to try this recipe. Thank you for sharing! In my opinion, cow milk is only for calves 😀 and luckily there are many different varieties of milk available, many thanks for the recipe, looks delicious! That dessert looks delicious! Yes, I keep milk in the fridge always, Not only are we cereal eaters, I just tend to cook a lot with all these staples. I guess that’s why they call them staples. 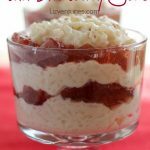 I love rice pudding and made almost 16 pints of strawberry jam last month…so I’m ready to try this recipe for sure! Rice pudding is delicious! I make a version of this with orzo. I love raspberry sauce, but this strawberry sauce looks like it would be just delicious! Yum. I love rice pudding. Great idea to make it into a trifle. Oh my this looks and sounds Delish!! I will definitely be making this! I’ve never tried to make rice pudding but I do like it! Pinning this one for later, even the kids walked by the computer and said I want that! I have never seen that brand of milk near me–but I will look for it now. I do love rice pudding but generally buy it in the individual cups—I could still make this using them and it does sound delicious!! This looks so delicious and easy to make. I have never try rice pudding before so off to pin this then hopefully try it soon 😀 Thanks for sharing the recipe. I have never tried rice pudding before, but I bet it’s amazing with that strawberry jam. I love that you serve it in layers. I love rice pudding and would love to try some of this now! I have never heard of Dairy Pure but will sure to check it out! I’ve had tapioca, chocolate, vanilla and butterscotch pudding before, but have never had Rice Pudding! Sounds like a delicious recipe! I have never had it either. Butterscotch is usually my go-to pudding, but I am definitely making it a point to try this.